Have you ever felt like cold emailing doesn’t work for you at all? Built a list, crafted some messages, hit ‘send’, waited… and nothing? Poor response, or no response whatsoever? You need an outbound outreach process, stat. At Woodpecker, if we hear the phrase “cold emailing doesn’t work”, it’s usually from cold email senders who haven’t built an outbound outreach process. They often just got a contact list from somewhere, sent an email blast with little or no personalization, and crossed their fingers in hopes of seeing those leads coming. That kind of approach could, and probably did, work for some companies in 2008. But not today. 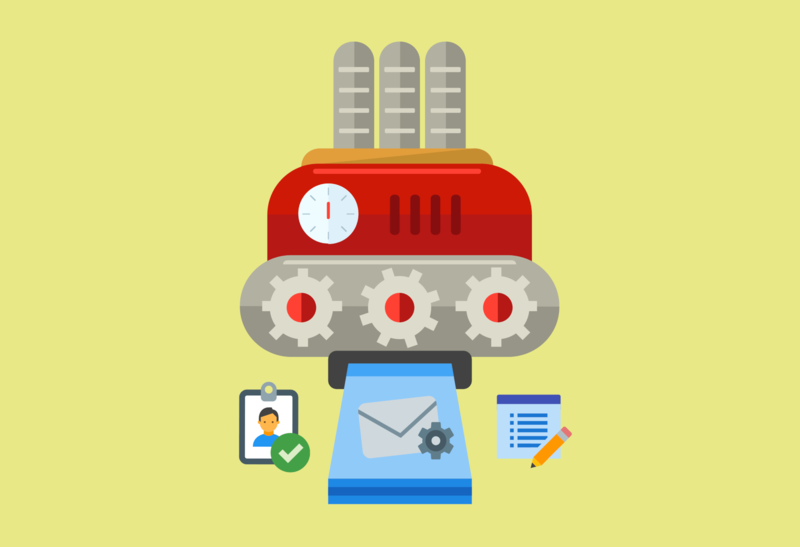 To make an outbound outreach process work today, you need to build just that, a process. And the process needs to be well-thought-out and persistently executed. There’s no template that works for all. There’s no toolset that works for all. You need to figure out your own templates, find your own toolset, and create your own way of outreach – adjusted to your target group, to your business, and to the goal of your outbound campaigns. Working out the process will require from you some time and tests. But that’s normal. From my experience, it’s important to plan every part of the process before you start sending anything to anyone. And prepare yourself for some serious testing. That’s why I decided to share those few steps in hope that this might make the planning and testing easier for you. This is absolutely crucial. Here’s why: if you target the wrong companies – even if you write the best copy, personalize your outbound outreach process, and find the contacts of the decision makers – your outbound efforts won’t bring the expected results in the long run. Yes, the first goal of your outreach is to get replies. But ultimately you aim at finding new clients or partners that will benefit from what you have to offer. Think about that while figuring out who your prospects should be. A good way to start is to take a look at your present customer base and look for some patterns: define the profile (or a few profiles) of the best customers. Analyze their businesses through and through. Talk to the customers and try to understand what problem you help them solve. And if you target marketing partners or influencers, think about their goals and their audiences. How could you contribute to their success? What would they gain from the cooperation with you? What sort of value can you offer to their audience? The first step, in such a case, would be to find websites and blogs that are logically connected to your own website or blog. Identify a common ground in terms of content. Define mutual benefits. Only when you figured out who your ideal prospects (companies and decision makers) would be, should you proceed to Step 2. This step can be very time-consuming, which is why finding the right tools to help you out will be vital. LeadFuze may save you hours at this particular step of the process. Let’s say I work for a SaaS business looking for new clients. After analyzing my current customer base, I discovered that your best customers are companies operating within a financial services domain, they’re small – 1-200 employees on average, and the decision makers who actually talked to your sales team and decided to purchase your solution were CEOs or founders (that’s pretty common when you target small companies). I also decided to target companies from the East Coast to minimize the time difference (I’m in Europe). Additionally, I checked the ‘Require email’ checkmark, as I’m going to contact my prospects via email. With this set of information, I can log in to LeadFuze and check how many leads I can potentially find. I actually defined such criteria, and after clicking ‘Start search’, I found out that LeadFuze has over 5k contacts to decision makers from this type of company. This allows me to estimate if I’m going to get enough of data for testing. 5k contacts is a lot. Now, I could get the contact details to all those prospects in LeadFuze. But I don’t want to get all the contacts. I want to know more about the companies. I want to sieve them through and find potentially ideal customers for my product. In my approach, I’m going to check those profiles, by going to their websites. From LeadFuze I can jump to their company website with a single click. Then, I would skip the companies that don’t match my ideal customer profile, and save only the contacts to people I really see as my potential clients. All the way through collecting the data for my outbound outreach process, I would be planning what I should write in my first-touch message and in my follow-ups. While building a successful outreach process, you need to think of more than one step at a time. Why? On one hand, the data you find and collect may give you some ideas for the copy of your emails and follow-ups. On the other hand, you may have some previous ideas for the email copy, and shape the data collection process in a way that will allow you to get to the right data. You’ll achieve goal #1, if the previous parts of your process were well thought-out and equally well executed. That’s why you collect more than just email addresses of your prospects. That’s why you use tools like LeadFuze. That’s why, sometimes, it’s a good idea to look for even some more information about your prospects’ businesses – to find some relevant references you could use in your email copy. Now, as the integration between LeadFuze and Woodpecker is live, you can easily push your lists from LeadFuze to Woodpecker campaigns and use some of the data for personalization. You can also add some additional references – a mention of a blog post, a Quora quote, a piece of review from G2Crowd (for SaaS companies) or Clutch.co (for digital services companies). 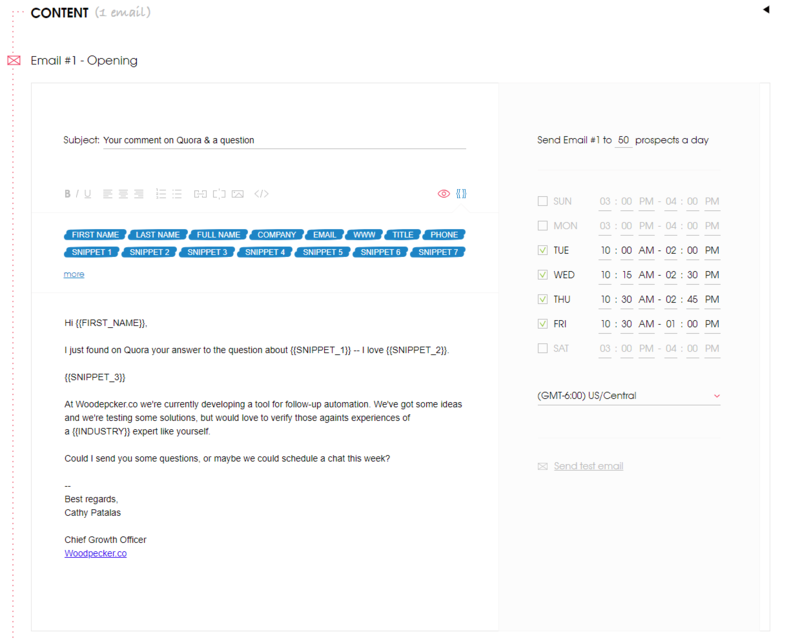 You can also prepare a few versions of sentences linking the introduction with the further parts of your email (Snippet_3 in the example above). Remember that using variations in your email copy positively affects your email deliverability. I usually personalize the intro part the most, but you can add some custom fields (or snippets, as we call them in Woodpecker) to other parts of your email as well. As to goal #2, Woodpecker may also help you with the follow-up part. Your follow-ups should be a continuation of your first message. They should be properly scheduled, and sent at the right time – not too soon, and not too often. Sending them manually would be probably possible, but it would also drive you crazy and refrain you from doing anything else but sending emails. The steps 1, 2 and 3 of your process may require a whole range of tests before you start getting predictable results. Create separate lists of prospects in LeadFuze for some split-testing purposes. You can also divide a greater list of prospects from the same group into two separate, yet homogenous, lists. There are some great ideas for a/b testing here on the LeadFuze blog – get some inspiration from them. If you test persistently, make conclusions and keep improving your outreach process, you’ll see some positive responses soon enough. That’s when you go to Step 4. Getting replies from interested prospects is not the end of the process. Now a lot depends on how, and how quickly(! ), you react. I can tell you that getting back to an interested person within a few minutes makes a great impression and increases your chances of keeping the conversation going. Your emails showed them that you care. Don’t ruin the impression you’ve made on them. That’s why it’s important to schedule your campaign at the right time. You can adjust to their timezone – but if they reply shortly after they read your message, you may not be there to get back to them. And yes, it’s email, so they can reply whenever they want – and you have to sleep. But fitting the delivery time into a period when neither of you is asleep may increase your chances of being there when they respond. Paying attention this is key to a successful outbound outreach campaign. Your messages, if written right, were focused on your recipients. Don’t let the focus change when you continue the conversation. If you want to introduce your solution to them, first ask about their business, try to figure out what they struggle with, what their goals are. Only then try to fit your product or service into the picture. If you want to invite them to a marketing partnership, first try to figure out what their marketing goals are, what their audience cares about, what they could get out of the cooperation. Only then propose some actions that the both of you can benefit from. Outbound emails won’t magically bring you new customers. You can work out and patiently execute an outbound outreach process that will keep bringing you leads, though, which you may turn into customers. Invest some time and effort into it. Don’t give up on constant testing. Draw from your experience, use your intuition, and let the technology help you make the process work. Only combining all of these will allow you to create a strong, predictable and measurable source of highly-targeted leads for your business. Cathy Patalas is Chief Growth Officer at Woodpecker.co, cold email and follow-up automation software that allows you to personally contact ideal prospects and build human-to-human business relations at scale.